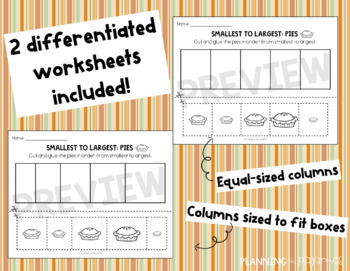 Thanksgiving pies size comparing worksheets and cards to include in a Thanksgiving theme! 3 sets of size ordering cards, and 2 worksheets included to practice non-standard measurement skills and order pies from smallest to biggest. 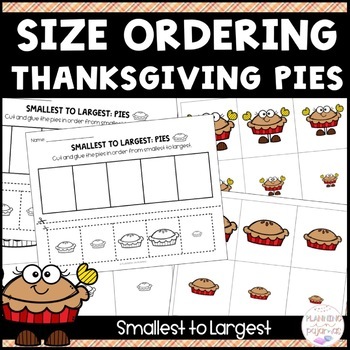 ✓ 2 worksheets to color, cut and glue the Thanksgiving pies in order from smallest to largest. 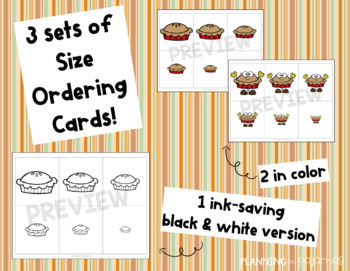 ✓ 3 sets of pie size ordering cards, 2 sets in color and 1 set in black and white.